A French Wedding is a delicious novel about six college friends reuniting on the coast of Brittany to celebrate one of their own's fortieth birthday. With sumptuous food and plenty of wine, the table is set for tricky romantic entanglements, fiery outbursts, and a range of secrets. Readers who loved The Vacationers and The Little Paris Bookshop will devour this irresistible novel. Max is a washed-up rock star who's about to turn forty and feeling nostalgic for his university days. All he says he wants for his birthday is to host his old friends at his house in the French countryside for a weekend of good food and reminiscing. But he has an ulterior motive: Finally ready to settle down, this is his chance to declare his undying love to his best friend, Helen. Max's private chef, Juliette, has just returned to her hometown after a nasty breakup and her parents' failing health move her to sell her dream restaurant in Paris. Still reeling, Juliette throws herself into her job, hoping that the peace and quiet it offers will be the perfect cure for her broken heart. But when Max's friends arrive, the introverted, dreamy Juliette finds herself drawn out of her orderly kitchen and into their tumultuous relationships. A weekend thinking about the past spurs more than one emotional crisis, as the friends take stock of whether they've lived up to their ideals. Together for the first time in years, it's not long before love triangles, abandoned dreams, and long-held resentments bubble over, culminating in a wedding none of them ever expected. HANNAH TUNNICLIFFE is the author of two previous novels, The Color of Tea and Season of Salt and Honey. She is founder and co-author of the blog Fork and Fiction, which, unsurprisingly, explores her twin loves--books and food. She currently lives in New Zealand with her husband and three daughters. 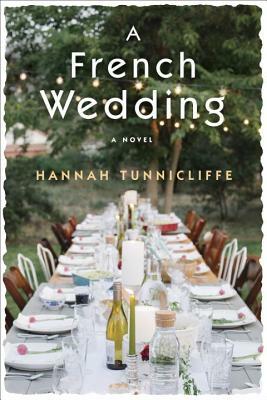 "Tunnicliffe sets the proverbial table with plenty of plot twists and surprising character sketches"
"A French Wedding is a delectable page turner with huge heart from an author who has proven herself to be an expert at creating endearing characters and compelling stories. Hannah Tunnicliffe writes with warmth and emotional depth about life in all its stages and love in all its forms. A bonus: she writes about food with true passion too, which makes this novel even easier to devour!" "One of my favorite authors, Hannah Tunnicliffe transports you to Paris and the French countryside, where food, friends, romance, old longings, and new beginnings await an unforgettable cast of characters."